callupontheauthor.com The Electric Soft Parade/Brakes man’s solo work is every bit as interesting as the songs he performs with his bands. This one, a driving beat, fuelled by staccato drums is strangely engaging, all the more so because of the laconic vocals. entertainment-focus.com With a very psychedelic feel to it, ‘The Last Blast’ opens at a furious pace… This song could fit into the soundtrack to any 60s movie about Carnaby Street. It’s certainly catchy simply for its beat… Full credit to White for creating this sonic landscape. Included in the single are two covers, Einstein’s Day (originally by Mission Of Burma) and Brazil (originally by Joao Gilberto) with the former song probably the more interesting of the two with a nicely paced shimmery twangy guitar. flyglobalmusic.com (click link for full review) This is a bit of a surprise, it’s not often that you’re able to mention Mission Of Burma and João Gilberto in the same review, but then ‘The Last Blast’ is an unusual EP. It reminds me of Julian Cope (around the time of his best album, Jehovahkill or even Sparks or early Roxy Music, Magazine or more recently, Pop Levi? ), a theme that’s taken up on the ‘Joy Balloo Megamix’ (shame it’s shorter than the original). Ian Chambers (fan review) Following the more stripped down approach of his previous solo album I Dream Of Black, this time round he comes out all guns blazing with new single The Last Blast. Propelled by wonderfully dirty, scuzzy guitar, powerful rhythm section and piano line, the song rides along on a wave of distortion and catchy lyrical hooks, managing to combine the explosive anthemic nature of Guided By Voices with the frenzied, taut guitar attacks of Mission Of Burma. On this evidence forthcoming album The Maximalist should make for one hell of a listen, impressive stuff. The Last Blast, “a dissection of the life and work of notorious World War II novelist Sven Hassel” (an interesting story by the way), is as suitably manic as its title and topic might suggest. Quite similar in delivery to Happiness in Magazines period Graham Coxon, the songs structure and melody are chaotic, but also equally well performed, managing to sound exhilarating enough to keep its own identity. Along with a couple of interesting covers as B-sides (and not just The Last Blast techno-club-mega-dance-space remix, or whatever the kids call them), this release suggests that Thomas White may be becoming a genuine hidden gem. shout4music.com (click link for full review) The B-sides on this release are the real find. Thomas White’s version of Mission of Burma’s Einstein’s Day is a gorgeous, up-tempo, drifting song. A wonderful, melodious creation and a far superior track to the single. White’s cover of ‘Brazil’ is a dizzying and demented Acapulco lounge-lizard of a tune which oozes with cheese… So with a lot to like, and a couple of unfathomable choices to ponder, it’s a good showcase of what promises to be an intriguing second album. subba-cultcha.com Danger! Concept! Yeah – it’s rather good though, crisp rocky pop about Sven Hassel. Reminds me a lot of Sack, but he’s actually from Electric Soft Parade, amongst other things. totalguitar.co.uk (album version) White blends elements of ska, garage-rock and electro to create something that bares a marked aural resemblance to a haunted roller-coaster ride. whisperinandhollerin.com His influences are diverse to say the least, spanning what he terms ‘jangle and all things harmonious,’ to a ‘secret love… for sludge of any kind,’ citing Sunn 0))) and Part Chimp, as well as The Dandy Warhols. How does this all pan out on ‘The Last Blast’? Really rather well, actually. It’s a dynamic burst of fizzy guitars propelled by a powerhouse rhythm and bolstered by some bold horns. The vocals are clipped with a hint of distortion, and White comes across like Mark E Smith in places, tossing out disjointed lyrics with a cynical sneer. It’s always a pleasant surprise to find a single that confounds expectations and is a genuinely inspired nugget of sonic gold, and this is indeed one of those rare finds. wordmagazine.co.uk (album version) With his brother Alex, Thomas is the core of Brighton’s psychedelic rockers The Electric Soft Parade, but he’s a prolific solo artist too – as well as an associate of fellow South Coasters Brakes. This is a fiery selection from his second solo record. Note: includes reference to Sven Hassel. ‘The Last Blast’ was nominated for Steve Lamacq’s Rebel Playlist: Idlewild won, Thomas second. 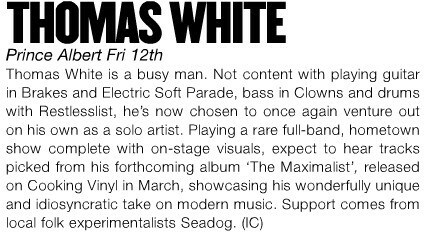 Damo Waters writes at Myspace: I should be getting very involved with helping out Thomas White in his live shows to promote his second solo album ‘The Maximalist’. In fact I was asked to drum on the forthcoming single, a re-recording of ‘The Last Blast’ from the aforementioned album. I haven’t heard the finished version yet, but I know that it’s a damn sight faster than the album version!